Want to cook and workout together? 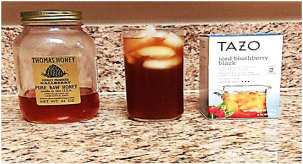 Start sweetening your tea with honey! Natural honey is a great source of carbohydrates, and it sweetens without adding any preservatives or additives to your tea lowering effects on your insulin and glucose levels. Well welcome to my kitchen. Have a seat, here’s a cold glass of Iced Blushberry Tea. Here is a phrase that was not in my vocabulary “eat right and exercise”. Allow me to begin walking you through how the Holy Spirit has used Trinity Fitness to reach my goals. TF introduced me to a lifestyle called clean eating. Wait a minute! Was my eating dirty? The journey began after the death of my mother, my best friend. In 2001 I had gastric bypass surgery after the March 2000 death of my mother. She died from complications due to her diabetes. She was only 53! At that point I was over 300 pounds and vowed not to get as sick as my mom did. I gained the weight between graduating from college in 1997 and starting my career in Knoxville, TN. It was me that packed it on. Being on the road most of the day and even into the night sometimes. Just made poor eating habits. By the time July 2001 came around I was able to lose about 50 of the pounds just eliminating the Depo-Provera shots. I lost about 80 pounds after the surgery. This sounds great, right? I have to admit; the loose skin was discouraging.